Music Time Academy is honored and thrilled to have accomplished saxophonist Joseph Buzzard join our staff at the beginning of 2015, teaching saxophone on Fridays. A graduate of the Armed Forces School of Music, Joe served in the United States Army Band for nine years. He worked as a saxophonist for jazz combos, big bands, concert bands and ceremonial bands, performing for many foreign dignitaries and U.S. officials. Mr. Buzzard was presented various awards, including the Army Achievement Medal and the Army Commendation Medal. Joseph has had over 2,000 live musical performances around the United States alone. 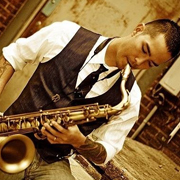 He currently performs with West Grand Boulevard, Radio Keys, and The Hip Kid Collective at weddings, clubs and notable music venues around the Bay Area, including the Boom Boom Room, Slim’s, and Biscuits and Blues. Joe also takes great pleasure in performing with the Los Medanos College Jazz Ensemble, Gospel Choir, and various Jazz Combo groups as he currently pursues an Associate of Arts Degree in Music at Los Medanos College. He studies privately under the highly regarded saxophonist and educator, Michael Zilber. Joe is also the founder and the President of the Los Medanos College Jazz Society.